Adult moths emerge from the trees in late summer, usually mid-July in southern Illinois and mid-August in northern Illinois. At this time they mate and deposit eggs in crevices or wounds in the surface of the bark and at terminal buds. These eggs will hatch about 10 days later, usually in early-August in southern Illinois and late-August in northern Illinois. The young larvae will begin to move across and feed on the surface of the bark for several weeks. When the caterpillars mature, they will begin to spin cocoons where they overwinter. In the spring, the larvae will become active again, moving across the bark for several days before boring into the tree. 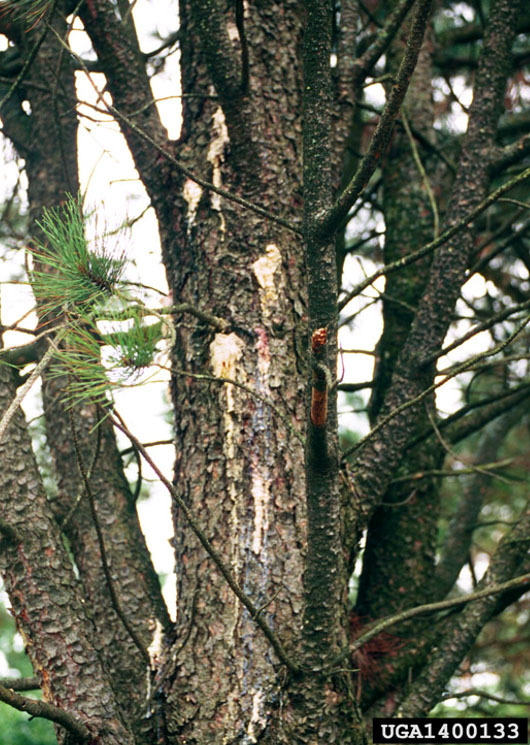 While these insects can be difficult to control after they bore into a tree or while they overwinter, the larvae moving across the surface of the tree are susceptible to chemical controls are can be targeted. The caterpillars range from 1/16 of an inch long when they hatch to 3/4 of an inch long when they are mature. They have tan or green bodies with small dark spots and can be found at the base of terminal buds or in the grooves of the bark.